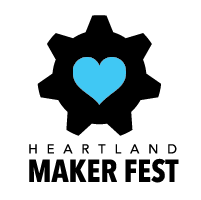 Only days left until Heartland Maker Fest 2014! The Heartland Maker Fest is Makerspace Urbana‘s annual event celebrating the amazing makers in Urbana-Champaign and the surrounding communities. Come learn to spin your own yarn, create art from math, or perhaps design and print a 3D object. This year’s fest will be full of family friendly maker fun and showcase all kinds of local maker talent. You will also have a chance to hear many speakers discussing the maker movement and DIY phenomena. And thanks to River City Labs Makerspace we’re also planning a Quadcopter Obstacle Course with prizes! If you have a small quadcopter that can be flown safely indoors, bring it! This year’s Fest will be be held on Saturday, October 18 from 10am to 4pm at the Lincoln Square Mall in Urbana, Illinois. Interested in volunteering at the fest? Sign up here. We need you!